It’s Flash 909, and Amiga Flash. Well, there’s more, well into the “Things Adobe Wouldn’t Normally Expect People to Do With Flash” category. There’s 8BitBoy (warning: link autoplays music), a Flash-based player for Amiga MOD tracker tunes. There’s a 909 emulation (cutely named FL-909). There’s open ActionScript 3 source called popforge [@ Google Code] with all the Flash-hacking tricks needed to do audio. The Hobnox Audio Teaser is a new approach to give you a great opportunity to create music [compositions] online in your browser. The underlying audio engine is based on dynamic digital signal processing to provide very complex audio compositing in Flash. The graphical user interface is based on an unlimited sized desktop to layout your chosen devices as you wish to operate. 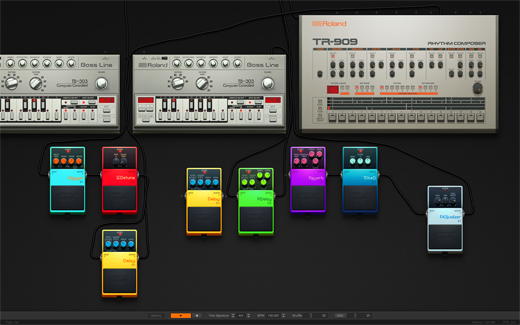 The first application design delivers you some Roland emulations and effect floorboards to play with. Since this is a Teaser, you don’t have the option to save your environment. However, already at this early state we provide you with some well-known software features as history, clipboard and auto-alignment of the devices. It’s not all sunshine and happiness. These are hacks, not fully-supported features of Flash — and Adobe, like so many developers of supposedly “Rich Internet Applications,” often doesn’t have a clue about sound. Andre has run into problems with his hacks for that reason. Now, I know what you’re saying — why should Adobe, a hugely-successful business, care about your MOD player? And of course, they shouldn’t. But that’s not the point. The vision of Rich Internet Applications is software that is expressive across media, and that includes sonic capabilities. Maybe people don’t care about the ability to play old Amiga tracker tunes — well, unless Timbaland is looking for some new tracks. But they might care when speech and creative music applications and interactive sonic interfaces come into play. We’ll never know for certain if the RIA developers keep ignoring audio completely, because then we lack the platform for people to do interesting stuff. In the meantime, though, it’s comforting to have guys like Andre hacking in brilliant ideas. I hope Adobe takes note. Thanks to Chris O’Shea for this link. Be sure to check out his all-new Pixelsumo blog.